Peanut butter was named one of the Top 5 Foods That Should Have A Place Your Diet by CNN. Whoever wrote that probably wouldn’t have wanted you to mix it with butter and sugar, but regardless of the increased amount of calories and fat, you can still feel good about giving yourself a healthy dose of antioxidants. And eating a Super Food that has protein and fiber, lowers cholesterol and your risk of heat disease. Because, like I told you at the beginning of the year, I’m trying to seek a balance in my life. If I am going to have a fabulously delicious dessert, I also want it to have some good stuff in it too. I have also decided to cut food dyes out of my diet all together by the end of the year. Because, unlike peanut butter, they have zero benefits, lots of risks and are known carcinogens. I’ll write more about that later once I’ve figured out how to conconct an all natural red food dye. I don’t want to be perfect, I just want to find a balance in my life. 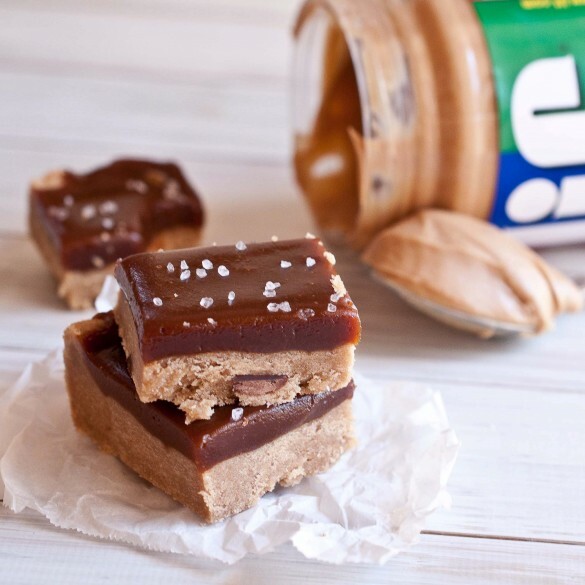 Peanut butter caramel bars are a great balance, giving you a dose of healthy goodness with an incredible dessert. But don’t misunderstand me, this is in no way a diet food. They are high in calories and a treat that you should enjoy every once in a while, but at least you have the peace of mind that there are also health benefits. In the bowl of a stand mixer, cream the butter and sugar. Add the peanut butter and vanilla and beat on high until well combined. In a separate bowl combine flour, salt, and baking powder, stir to combine. Add the flour mixture to the stand mixer and beat on medium speed until mixed well with the butter mixture, scraping the bottom of the bowl occasionally. Gently fold in the chocolate chips. Press the shortbread into the bottom of the baking dish in one even layer. Chill in the refrigerator for 30 minutes. Preheat the oven to 350. Bake for 25 minutes or until the edges have turned a golden brown and have started to look dry. Allow to chill in the fridge for 10-15 minutes. In a pot over medium high heat, add the peanut butter and the cream. Stir continuously until the peanut butter has melted and is well combined with the cream. Remove from heat, add the vanilla and set aside. In a separate pot over medium high heat, combine the sugar, & corn syrup. Stir until the sugar has dissolved. Allow to boil, without stirring, until the mixture reaches 230 degrees, about 5 minutes. While the caramel is cooking, do not stir, but swirl the pan every 30 seconds to redistribute the caramel sauce evenly. Once 230 degrees is reached, add the butter, stirring to allow it to distribute and melt, then remove from heat. Stir in the peanut butter cream, adding slowly as it will bubble up furiously. Pour the caramel over the shortbread and refrigerate for 4 hours, or until set. Sprinkle the top with the sea salt. Remove from pan using the parchment paper and cut into squares. I definitely need more balance in my life. Cutting out dyes is a great way to go too. These bars sound so good, and right up my alley! Ha-good to know about peanut butter. Especially since I have 2 jars (one crunchy and one smooth) in my house at all times! These layers do look delicious. 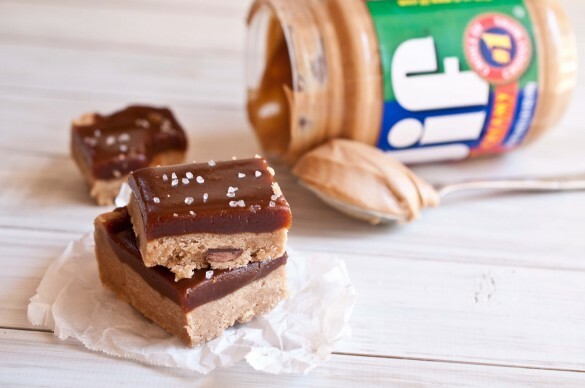 I am really intrigued by the pb caramel on top-no doubt that tastes amazing by itself! Creative and tasty. Buzz buzz! Oh. My. Gosh. These look incredible!!!!! I can’t wait to try them!!! Eeeek I want one right now! Actually, that’s a lie. I don’t want one. Just another reason to love peanut butter! These bars look incredible! Oh my word! I am in love. Thank you for this recipe (or maybe not, we’ll see how my clothes fit a couple weeks). These are truly divine. Way to go on cutting out artificial colors too. I’ve heard that you can use beets for red food dye, but I’ve never tried it myself. That is all the help I can give you on that one, but way to go! I’m going to try beet powder, but I’m a little worried about the taste. I’ll let you know how it goes! Oh, yeah, these bars are winners! I’ve never heard of a pb caramel sauce, but I’m certain I’d love it!!! And, BTW, I think you can use beet juice as a red food coloring :)I get a bitter taste from red and black food dyes…a good reason to avoid them. Oh my word. How could these bars not be winners? I need them in my life stat! These look so drool worthy! I understand where you are coming from with the food dyes. I try to avoid it whenever possible. These bars look AMAZING!! PB, caramel, what a great combo! this sounds absolutely delicious + that’s definitely a great goal to get more balance in your life! by the way, have you tried using beets for a natural red dye yet? i haven’t, but i’ve had some friends who have! Thanks Amy! I bought beet powder and I’m going to mix it with raspberry juice and see what happens. I’m a little afraid that it will turn out purple, but we’ll see! These bars would bring a lot of balance to my life! The name itself is enough to have me drooling away – you are a genius, these look decadently perfect! Those bars look amazing! I love peanut butter, especially paired with chocolate. You got me with that sprinkle of sea salt on top! These bars look amazing! Where is the facebook love button ?!! This is too much! The man at home loves peanut butter while I fall for chocolate! One “gourmandise” to fit both our tastes! Pretty! This has been an extremely wonderful recipe. Thank you for posting it. These look absolutely amazing!! Love peanut butter, love chocolate, LOVE salted caramel!! What is your measurement for 1 stick of butter? 1/4 cup or 1/2 cup? The standard US measurement for a stick of butter is 1/2 cup or 8tbs. If you ever see “1 stick of butter” that is the right conversion.